Voice. Speak with a compelling, authentic voice. Put yourself on the page. Compassion. Demonstrate passion for your issue, yes, but also compassion for those involved. Speaking up also requires listening. Impact. Move your readers—to laughter, to outrage, to sympathy, to revelation. Anything goes, so long as something meaningful is at stake. Humor / Humility / Honesty. Endear yourself to your reader. Balance a lightness of approach with a seriousness of purpose. Engender trust. The subject matter of these essays matters less than the substance of the ideas therein. You can highlight an injustice, issue a call to action, find big meaning in small things, reflect on a personal struggle, etc. The voice-driven personal narratives of the “This I Believe” series (www.thisibelieve.org) and the Moth Radio Hour (http://themoth.org/radio) provide some good examples. 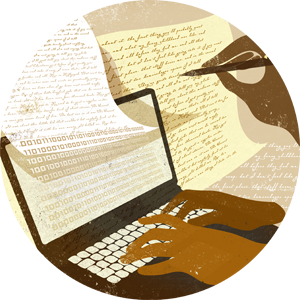 The essay can be something written earlier or for a class or can be something written specifically for the contest. Submit electronic copies of essays in .pdf or .doc format to b.connors-manke@uky.edu with FEINBERG CONTEST in the subject heading. In the body of the email, please include your year at UK, major, and the course for which you wrote the essay (if applicable). Include contact information (name, email, phone #, student ID #) in upper left corner of first page. Open to all UK undergraduates. $100 to top entry selected by committee; winner to be honored at the WRD Awards Ceremony in spring. Length maximum is 15 pages, double-spaced. Multi-media projects that incorporate some writing element are permitted (including photography, artwork, artifacts, electronic media, etc. ).